“Once Were Nomads” uses textiles to examine the traditional life and culture of the nomadic peoples of Baluchistan, a territory that straddles the modern borders of Iran, Afghanistan and Pakistan. 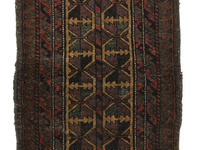 The exhibition includes 45 examples of textiles including rugs, clothing, animal trappings and other such items, ranging in date from the mid-19th to the late 20th centuries. In recent decades, however, this nomadic way of life has become increasingly difficult to maintain as changing political and economic conditions have limited the free movement of people within countries and across international borders. “Nomads still exist in Baluchistan, but their numbers are dwindling and their culture is changing so rapidly that this ancient way of life may vanish from the region by the end of the 21st century,” said Mason. The content and presentation of the exhibition was organized in collaboration with Hope College student Caleigh White ’20, whose curatorial work on the exhibition was supported by the Borgeson Scholar Program and the John H. Dryfhout ’64 Internship endowment. Many of the textiles featured in the exhibition were donated or lent to the museum by Verne Trinoskey and Paula Armintrout Trinoskey of Eureka, California, who also provided important historical information and technical analysis of the weaving. Admission to the exhibition is free, and all are welcome. As a teaching museum, the Kruizenga Art Museum strives to be a center for curiosity, inspiration and cultural exploration. By displaying artworks from a wide range of cultures and historical periods, the museum aims to foster the qualities of empathy, tolerance and understanding in all of our visitors. Thanks to the generosity of our patrons, the Kruizenga Museum’s collection is constantly growing. In an increasingly diverse and global age, it is important for the Kruizenga to collect and exhibit images and objects that can help tell as many different stories as possible. The Kruizenga Museum collection reflects patterns of cross-cultural exchange that in some cases are centuries old and yet continue to shape our world today. We welcome you to explore this exhibition with an open mind. The exhibition was not designed to be seen in a certain sequence and we encourage you to draw your own connections between the artworks. If you have any comments or questions about the exhibition or the Kruizenga Museum collection, please contact a museum staff member. The Kruizenga Art Museum galleries are typically installed with a mix of temporary exhibitions and permanent collection displays. These exhibitions and displays are planned to complement course offerings in the college’s academic curriculum and usually change, partially or completely, at the beginning of each semester. The museum’s exhibitions are further augmented by lectures, artist demonstrations, film series, musical concerts, dance and theater performances and other relevant educational programs. An endowment gift from Holland residents Dave and Jane Armstrong provides funding for at least one exhibition-related lecture every year, while other programs are made possible through annual gifts and campus partnerships.